In the history of recording consoles, few other audio desks are as shrouded in romance, mystery, and desire as the Abbey Road/EMI Studios REDD.51. Two of these valve-based desks were used in Abbey Road Studios in the 1960s. Only three were ever built, and only one is known to exist today; it’s housed in Mark Knopfler’s British Grove Studios in the UK. From the last few sessions for With The Beatles in 1963 through 1968’s White Album, every Beatles session at Abbey Road was tracked and mixed on the REDD.51 desk. That run ended in 1969, when the studio installed the new solid-state TG Series desk used on the band’s final opus, Abbey Road. Since REDD desks were built in house and only for use in EMI-owned facilities, for the last 45 years engineers young and old could merely dream of tracking and mixing through a REDD of any sort. With the birth of the Abbey Road plug-in line a few years back, we were able to get part of the way there and roleplay that we were dressed in white lab coats, wandering the halls of EMI Studios and pushing up our virtual Painton Quadrant faders, but the sound of the hardware remained largely elusive save for a few small defunct boutique and DIY companies… until now! As we described in our October 2014 review of the TG2-500, Chandler Limited of Shell Rock, Iowa, has a 13-year history building and releasing microphone preamps, EQs, and compressors based on the aforementioned Abbey Road/EMI TG Series desk. 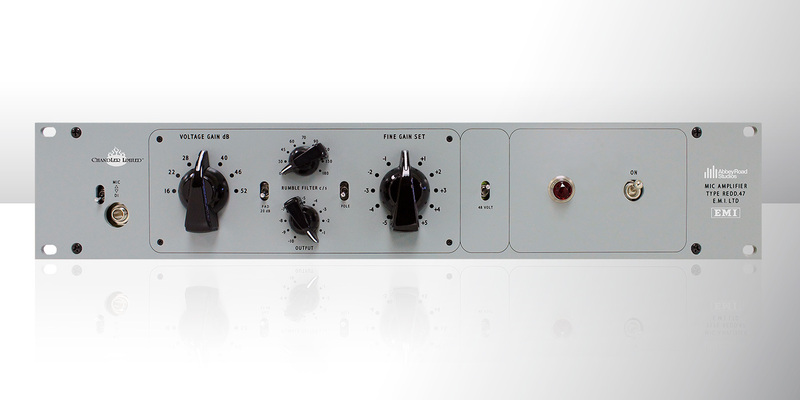 Thanks to its ongoing partnership with Abbey Road, Chandler Limited is now moving into recreating the earlier tube-based fare, and it all starts with the Chandler REDD.47 tube microphone preamp. The REDD.47 was/is the line amplifier component of the REDD.51 desk. It was built to replace the modified Telefunken/Siemens-made V72 amplifiers used in the previous REDD.37 desks, the ones used for the Beatles’ first album and part of the second. The REDD.47 was developed and built by EMI’s “Record Engineering Development Department” or REDD for short. While it was created as a replacement for the V72, the REDD.47 was a from-scratch design; Chandler’s Wade Goeke explains, “they share no similarities other than they both use tubes.” For the full, fascinating story, I recommend Recording The Beatles by Kevin Ryan and Brian Kehew. Before we move on to Chandler’s take on this mythological beast, let’s look back at the original modules. Unlike today’s rackmount mic preamps, the modular styles used by AMS Neve, or the ubiquitous 500 Series API modules that offer all of their controls on the front panel, the line amplifiers in the REDD desks were small rectangular selfcontained modules with few to no controls on them at all. They popped into the sides of the REDD desks, where they controlled gain levels for every input and output on the desk, from the microphone inputs to the reverb sends and more. The REDD.51 desk contained up to forty REDD.47 amplifiers! Unlike the V72 — which was self-powered, hot swappable, and had a fixed output level with no front side controls — the REDD.47 drew its power from the desk and needed the desk to be powered down to be changed. It contained a 3-position Voltage Gain switch with settings for 34, 40 or 46 dB output levels, and it also had additional Fine Gain control for the precise balancing of its many possible tasks on the desk. This Fine Gain control was hidden behind a plastic cap and accessed with a screwdriver. All other standard channel controls were located on the desktop, such as further volume attenuation (which on the REDD.51 was an additional 0 to -30 dB in 6 dB steps), a simple bass lift (what we would call a low cut), reverb chamber sends, basic panning, EQ, and more. While the new Chandler REDD.47 is, on one hand, simply the line amp REDD.47 of old in a new casing dedicated to the task of microphone preamplification, it is not just a straight port of the original. The new unit has been fitted with a few other accoutrements to make it useful in the modern recording landscape, and also sports some extra Chandler-centric mojo. The Chandler REDD.47 is a 2-space 19″ rackmount box dressed in the same original battleship gray as the original REDD desks. All of its black knobs, big and small, are spec for spec re-molds of those found on the original desks as well. ~ Voltage Gain Control: This 7-position stepped switch is an updated variant of the original found on the original REDD.47 module. Where the original had only the three settings mentioned above, the Chandler version has seven: 16, 22, 28, 34, 40, 46 and 52 dB. ~ Power switch and a red jewel power indicator. One thing to note is that all the front panel switches for Pad, Pole, and Phantom Power are all on when in the down position, backwards from most modern boxes where up is on. 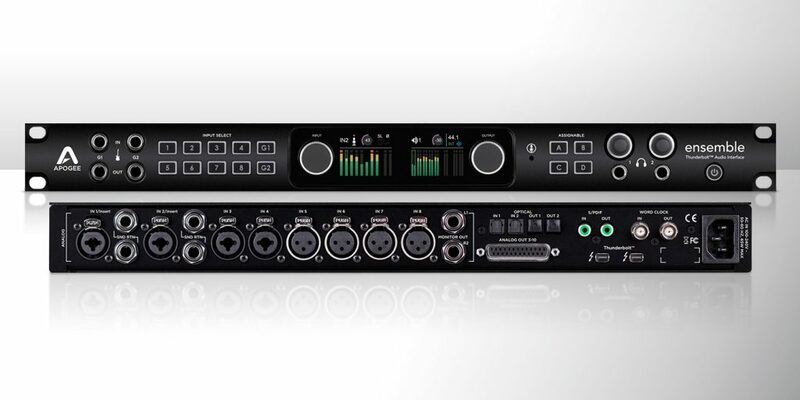 Around back, the unit has only an XLR input, XLR output, and a 3-prong IEC power cable socket. Unlike Chandler units of old, the REDD.47 is internally powered, so no external power supply needs to be purchased. Internally the REDD.47 is a deceptively simple circuit. It is transformer-balanced with said transformers custom wound to the original specs. It uses an EF86 tube on the input stage and an E88CC on the output. It has a maximum gain of 57 dB and, like the original, it has a 200 ohm input and output impedance. I was sent one of the first available REDD.47 units in production — serial number 5, in fact. My first day with it was a round of guitar tracking for the Madison, WI based heavy prog band the Mood Manual. Matt, their guitarist, uses a very simple guitar setup: a custom-built Les Paul copy, a delay pedal, a 100W Marshall tube head, and a 4×12 slant cabinet, switchable to 2×12. To capture his rig I used a Shure SM57 into the REDD.47, a Royer R-121 or AEA N22 into a Chandler TG-2 preamp, and an AEA N8 (also reviewed in this issue) as a room mic, also into a channel of TG-2. First of all, the REDD.47 and the TG-2 could not sound more different, but stacked together with triple-tracked and layered guitar parts, the sound was simply massive. We next decided to track some of Matt’s guitar solos direct to try and get the “Revolution” guitar tone. I plugged in the guitar through the DI, cranked up all of the inputs and outputs, and… no dice. We got loud, clean direct guitar. After a text to Wade, I found out that the guitar signal needs to be at line level via a DAW send or a second preamp (see the sidebar). Once I followed that simple rule, there it was: loud, proud and grungy as all get-out! A classic tube console overdrive. However, on a loud miked source such as lead vocals, drums, or miked guitars, the REDD.47 is capable of incredible distortion that is thick and intense but still musical. Over the next two months I continued to use the REDD.47 on vocals, congas, tambourine, cajon, bass cabinet, acoustic guitars, and on a mono front-of-kit mic. In each scenario it yielded excellent results. As to microphone selection, it plays no favorites. However, if you are using low-output ribbons or dynamic mics, you will need to stick to louder sources such as drums or screaming guitar cabinets. 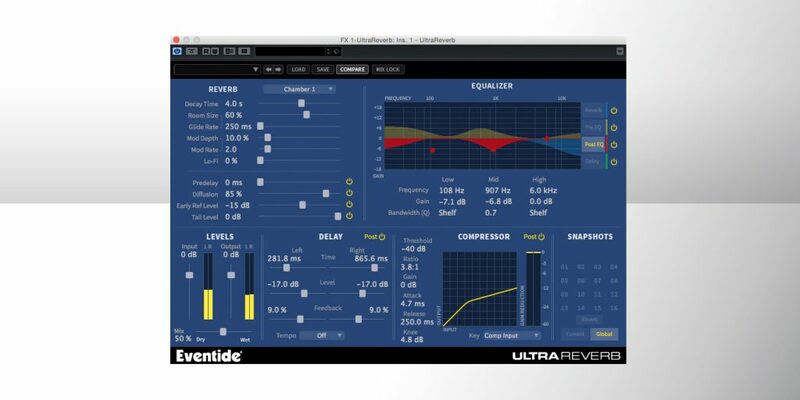 The REDD.47’s 57 dB of gain is just on the edge for spoken word or sung sources as far as volume and noise floor are concerned. Having said that, in normal use the REDD.47 is surprisingly clean and quiet for a vintage-style tube preamp. The Rumble filter is worth a special callout — this is not your typical highpass filter! Its name is actually quite appropriate in that it gently and smoothly gets rid of low rumble, but it has a softness that still sounds nice and weighty even up around 70–110 Hz, as opposed to the stark hard cut found in many modern mic preamps. To really get my bearings on the sound of the REDD.47, I did a round of side-by-side comparisons with Chandler’s other Abbey Road preamp, the TG-2, which I have been using for years and know well. After tracking a full song using a pair of matched Lauten Atlantis mics going to each amp, I was impressed and even surprised at how completely different the two preamps are from one another. The TG-2 was all of the things it’s known for. It was super tight with an upper mid punch and big solid low end. In contrast, the REDD.47 sounded wider and more dimensional, with a very diffuse top end that has a slight amount of raw fuzziness to it that is hard to describe. It’s what I call “dusty air.” Its bottom end is immense, thick and pillowy, vs. the TG-2’s tight punch. I also compared the DI inputs of the two with a Fender Jazz Bass and the results were similar. Again, the TG-2 was tight and forward with a great funk/jazz mid presence, while the bass through the REDD.47 was big and full and at times more felt than heard. I tracked a simple song only using the REDD.47. It featured mono drums, double-tracked electric guitar, acoustic guitar, double-tracked vocals, percussion, and DI’d bass. It sounds trite and even romanticized, but the song came out sounding like an old-school record, even with no EQ or compression. Before we go, I have to point out that while this is a port of a vintage tube preamp, along with its wonderful distortions, its dusty top end, its width and its low end fullness, there lives a hi-fi opulence as well. As such it can sound clean, smooth, and modern, or thick and vintage, with the turn of a few knobs… making it more that just an occasional “vintage flavor maker.” It’s really versatile; I would have no problems tracking a string quartet, a jazz trio, or a metal band. It really is one of the nicest sounding mic pres I have ever heard or used, period, exclamation point! Sure, some of that could be my Beatles-colored glasses, but I have heard nothing else with this sonic thumbprint on the market in my 10+ years of reviewing gear. Congrats, Chandler! Now, where do I send my first born, my middle child, the youngest kid, and my cat… OK, maybe not the cat. Wade, you’ve been making the Abbey Road TG Series gear for over a decade now. What made you move to the REDD/RS Tube side? Wade Goeke: When I first started showing designs to [Abbey Road head engineer] Pete Cobbin, he mentioned that the REDD.47 was his favorite preamp. That was ten years ago and I’ve wanted to do it ever since, but all good things take time! How faithful is the REDD.47 to the original? Since Abbey Road had to approve it… it’s very close! What things did you add or alter from the original? Any Chandler-only additions or improvements? The most significant were the expanded Fine Gain and the Rumble Filter. On the original units, the Fine Gain was a small adjustment for matching the console channels. I gave it much more range, not simply for more gain, but to expand the tonal selection. The Fine gain at –5 is much cleaner than an original REDD module in both distortion and noise floor. Fine Gain at +5 is much “dirtier” than the original, with more harmonic distortion to make it easier to overdrive the unit. Also, in my opinion, the preamp sounds thicker with the Fine Gain set high. And what about the Rumble Filter? The Rumble Filter is a unique design that uses the input transformer as its lowcut circuit. On the console it was a single setting that required connecting a jumper on the module. It was not easily accessible and to me it seemed almost like an afterthought. In proper early EMI fashion the documentation even recommends against using it because it adds distortion to the signal. Because it is such an interesting sound and design, I wanted to make it a more significant part of the unit, and I greatly expanded the frequency selection so you can easily tune it in. Anything else you would like to share should about the design of the new REDD.47? Distortion! The REDD.47 will distort like the old units… even more when combined with a high setting on the Fine Gain. But! You still have to distort it the way it was done on the classic songs, which is by driving high gain into it. The distortion comes from overdriving the input stage, not by cranking the Voltage Gain! At Abbey Road they ran one module into another to accomplish this. 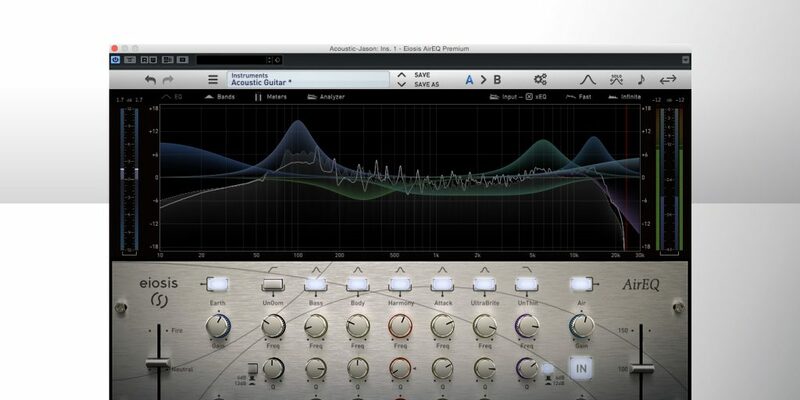 You can also use another preamp, or a line-level track coming out of your DAW. Yes, the DI. The DI jacks right into the tube circuit like it does on a guitar amp. It is virtually identical to plugging into an amp that uses an EF86 input tube, like an AC15 or vintage Selmer.